There are currently 1 user and 124 guests online. This game is best played in full-screen. Charles Blackwood happens upon a deed for the cliff-side manor known as Gethen Manor, a manor owned by a former mistress of his, Katherine Thorndale. Attached to the deed is a letter from Miss Thorndale, expressing how she wishes they'd not drifted apart, and inviting him to live in the manor. Suspicious, he ventures off to find the manor in a neglected state, the once well-tended garden now an overgrown mess of dead, dried up grass, long wilted trees and odious plant remains. As he explores the manor, he uncovers the manor's secrets. Secrets that, for him, would be better off forgotten. The beginning of my SchoolQuest series. The original intent was to crank out a game while at my school, idle and doing nothing in particular. Over time, it slowly changed course, and I am now working on the final project, which is not made at school, but rather, about my school. This is a simple Twine micro-game. It was styled and written in the span of four hours. I made this for fun and for your entertainment. Behold a twine text adventure game for ihavefivehat. What they asked for: stress, discomfort, anxiety, chronic pain, psychic distress, the feeling of being violated, etc. I found this a (good) challenge since I'm actually an optimist, whatever that means. Anyway, I hope you enjoy. Please do avail yourself of the youtube soundtrack link. It'll improve play. Twine games are like comics. Don't read too fast! I started writing this before the finale but didn't get a chance to finish until like 5 hours after. Geez I'm slow. 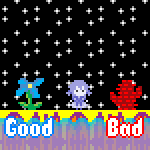 Anyway this is a quasi-remake of my old game, Tiny Cave. They don't have that much in common, though, they're only very similar in one branch. It's an Evil Dead/Evil Dead 2 situation. Anyway, it's got jokes, Gravity Falls references, and a very odd cameo appearance by a famous classic author, so try it out! Tournament 2015: the glory, the winning, the not-losing… it's all here! The official Twine game of the event sees you face off against the world's finest Tournament 2015 competitors in the quest to win Grand Finals. Use your mouse, and may your wins be great, and your defeats tiny. A game made for porpentine' s twinyjam. it' s kinda weird and lazy and dumb. This is a Five nights at freddy' s parody made in Twine. It satirizes most Five nights at freddy' s clones. It' s highly educational. made in twine and ms paint in some 30 minutes or so. 2018 Extra Notes: Yeah, basically what 2015 me said. This twine is largely nonsense but there's a vague plot going on. It's mostly just written in fairly poetic sounding language without actually being poetry. Not sure what my intentions were with this but, hey! It's a thing.